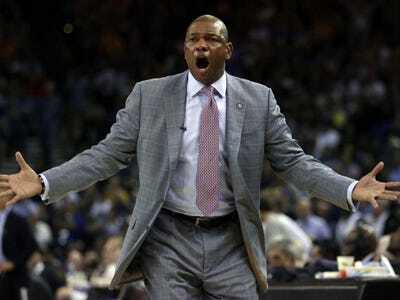 Ben Margot/APDoc Rivers said the Warriors would crush the Clippers in a playoff series. One of the most anticipated games of the NBA season so far was pretty much over by halftime. The Golden State Warriors pummelled the Los Angeles Clippers 121-104, running up 65 points in the first two quarters to take a 23-point halftime lead. The loss moved the Clippers to 3-2 on the season, and coach Doc Rivers is clearly not happy with how his team has played so far. After the game, Rivers ripped into the Clippers. The Clippers have played much worse than their record indicates. They nearly blew a win late in the game to the Los Angeles Lakers, and they struggled to beat the Oklahoma City Thunder without Russell Westbrook and Kevin Durant.